Do The Far Right Radicalise People? The one question we’re all asking given the attacks on Mosques and all the social media posts describing Muslims as ‘evil’. We must ask ourselves the key question of whether the far-right is radicalising people. Even before I joined Resisting Hate I saw countless social media posts that were all ‘Islam this, Islam that’, ‘Muslims this, Muslims that’. These posts were talking in a very negative fashion about their culture, their beliefs and the followers in general. It’s all I saw (going some years back) when I used to believe the far-right. So, in a way you could say that from what I was reading I was myself radicalised by the far-right. But I never went to the extreme lengths of attacking people, which is what the far-right radicalised people do. This is portrayed graphically in films such as This is England, in which a young boy (whose father is killed in the Falklands) is radicalised by a racist far-right gang. They talk about immigrants in a negative light and use hateful speech to make people believe what they’re saying. Shaun, the boy in the film, becomes involved with a skinhead gang who embark on a campaign of racism and brutality. In one scene, two Indian brothers are threatened with a knife, and Shaun simply smirks; he has been poisoned by what the far-right are saying. This is exactly how the far-right operate in the real world; they create this context of lies, wording it in such a way that it makes you think they’re right. They claim that the left-wing governments allow mass immigration and put the rights of immigrants before those of their own people. Again, this is purely another lie which the far-right spread. If you look on social media, there are various links to what I consider untrustworthy news sources, as well as links to Rebel Media and Info Wars who use hate preaching and propaganda to make us fearful of our own government and religion. They also use more common occurrences, such as a government’s failure to deliver on the promises they made during election campaigns. This is what draws people in; they are so angry at being lied to that it means they will believe pretty much anything if it seems genuine enough. Britain First are another example; they use posts such as ‘like and share’ for their own ends. This is also how I was drawn into the far-right years ago, something which I speak about in another article. It did lose me some friends, although at the time I didn’t think anything of it. This is how easy it is to be drawn into the far-right groups; it’s what they do – use topical issues to draw you in and grab your attention. But it goes further; I was even seeing posts from EDL back when ‘Stephen’ was their leader. ‘Stephen’ is the real name of Tommy Robinson, the alias of a man who was running a Luton FC hooligan firm. 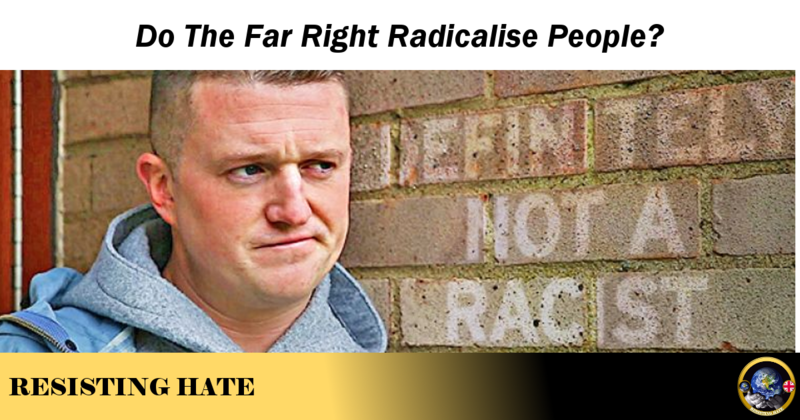 Tommy adopted the name to use for his far-right propaganda. Back then I was reading up on EDL – what they stood for and what they did. It gave very little information, and at the time I did consider joining them, but thankfully I never did, and I’m glad of it. But this is how dangerous the far-right are; they lack information in what they claim to fight for. This is just how easy it is for people to be radicalised by them; it makes them a particularly easy target when they are angry at the government. British League of Ex-Servicemen and Women, British Peoples’ Party, English National Association, Union Movement, British Empire Party, League of Empire Loyalists, White Defence League, British National Party, The National Socialist Movement, The Greater Britain Movement, The British Movement, The Racial Preservation Society, The National Democratic Party, The National Front, The National Independence Party, Anti-Communist Commando, National Socialist Group, National Party, November 9th Society, British Democratic Party, Constitutional Movement, British Defence League, Integralists, National Party of St George, Newcastle Democratic Movement, National Socialist British Workers’ Party, Trade Unions Against Immigration, National Assembly, United Party, British National Party, National Democratic Freedom Movement, Britannia Party, The National Socialist Action Party, Our Nation, Official National Front, Flag Group, International Third Position, White Nationalist Crusade, Association of British Ex-Servicemen, National Action Party, UK Patriotic Front, National Socialist Workers Initiative, English Solidarity, National Democrats, National Socialist Movement, British Resistance, White Nationalist Party, England First Party, Nationalist Alliance, British Peoples’ Party, New Nationalist Party, Epping Community Action Group, National Action, Britannica Party British Democratic Party, English Defence League, Pediga UK, For Britain Party. This number of groups is shocking, and I said, these are the known ones. If I was to add the ones across Europe and the United States of America, the numbers could reach into the hundreds. Going back to the earliest groups, when no internet, social media or television existed it was extremely hard to get their voices heard. The only way they could have grown in numbers was by using posters and word of mouth, with meetings in local bars or other such places. But as technology has advanced, the far-right have used the internet to create websites based on propaganda. Marketing products like T shirts and mugs are sold online to fund the hate of these groups and to increase their influence. They have key members on hand to handle their overseas operations, high profile haters such as Katie Hopkins and Tommy Robinson, who work alongside Rebel Media. We see fake news, news stories taken out of context, immigration used as a means of fear and racism and the state of our NHS being used to incite fear of immigrants. The list really goes on. Then the racism and xenophobia start to show. A lot. ‘Muslim this, Muslim that’. The fact that there are Muslims in our armed forces and our NHS is always totally ignored and avoided. They talk about how they hate immigration but there are migrants who work in our NHS as surgeons, nurses, doctors and more. They choose Britain to practice medicine as we have a top of the range health care with pioneering research in medicine. But do the far-right address this? No. They always use negative stories, and then label the whole community as the same. That’s how I was lured into the far-right… What I was seeing and reading daily made me angry and the far right offered me a focus for this anger. But it was the wrong focus and I quickly realised that although my anger was legitimate the targets I was taught to see as the source of my anger were not. Migrants and Muslims did not deserve becoming the scapegoats for all that is wrong with our country. With the combination of Al Qaeda and unemployment in the UK it was all ‘Muslims this’, ‘migrants are taking all our jobs’. That’s exactly what I was seeing on social media. For someone my age at that time, it is understandable to see how easy it was to be lured in and radicalised. But now we see YouTube videos from the far-right, and books being distributed that are written by racists, such as Mohammed’s Koran and Enemy of the State. Two books written by the same man, but people are ignoring the fact that he is a convicted criminal with a history of fraud and violence. People are always ignoring just how much money there is to be made from hate. As long as hatred puts a roof over the heads of the likes of Hopkins and Robinson they will not stop poisoning the populace with their extremist views. To answer the question of this article: yes, the far-right are radicalising people and indoctrinating people into hate and the breaking of the law. And this is all happening at an alarming rate. Social media is a massive problem for allowing these views to be spread to a wide audience and as we saw from the Finsbury Park murder the hate views put onto social media platforms are having a real impact on the way people behave offline. The far-right also use the electoral commission to try and gain political power and influence, much like the BNP tried to do and failed. They use donation requests to fund their hate and their own lifestyles. A lot of money is spent on travelling from country to country, spreading hate, and meeting with other far-right figures. Social media is a powerful weapon but it needs to do more to stop the far-right radicalising people and to stop them gaining such power. Having said that, I must also highlight our victory against For Britain. Signing up to their mailing list using my name ‘Wanderer’, I obtained crucial information regarding an event the very same day and passed on the information to relevant sources. Together, we all managed to stop the event going ahead. Sadly, they did find another venue, but For Britain leader Anne Marie Waters released a video on Facebook stating all public meetings are cancelled. As she clearly states, it’s doing more harm than good. It’s a victory for us and for all others who helped us obtain it. But the battle against hate is still not over. 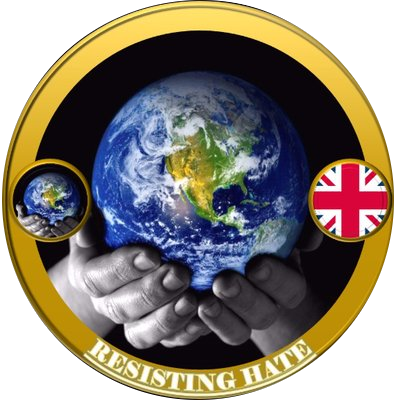 I have personally received threats of violence from many For Britain members for speaking out against Anne Marie Waters. My colleagues in Resisting Hate regularly receive threats of violence because we are speaking out against hate and racism. People want us silenced because we are interrupting the money making machine of radicalising the masses into hate. The radicalising machine is still functioning but at least we managed to throw a spanner in the works and Resisting Hate will continue to do so. To everyone who helped, I want to say a big thank you. You are a credit to the fight against hate. And if the far-right try to radicalise you, block the account and contact Resisting Hate. Instead of believing their stories, find the information and see if it’s true. Ask to see official statistics from a government source, all of which is freely available to the public. 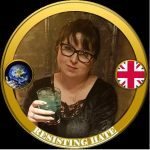 ⟵Why Am I Resisting Hate? No the people who have concerns about the amount of immigration coming into our country. .and the results on our hospitals schools infrastructure because of immigration. They are then shouted down…our elderly told to drop dead and so on. When the only recourse is joining like minded groups as we are being ignored. And most of these groups are not far right that’s a name all the liberal lefties give us. Then I say what do you expect. I think people are right to have genuine concerns about the state of our country and in particular the NHS. But the trouble is that those concerns are being directed toward the wrong people. The economic mess our country is in is due to poor political decisions, not immigration. Corporate tax in this country is a joke, high earners and big corporations are not paying anything like their fair share of the tax bill. This puts a massive strain on the spending budget and means that key services like health, policing, education and welfare are being underfunded. Automation of key work areas is also going to have an impact. I think it important that we take the concerns of the population seriously – we are in a mess and they are right to draw attention to it. But the mess will not be resolved by blaming immigrants and Muslims, the mess will only be resolved by making Parliament accountable for writing policies that benefit the people and not the minority ‘elitist’ rich.